The leaders of the world’s 20 biggest economies are meeting soon in Hamburg, Germany. This G20 Class of 2017 could get top marks by agreeing to support new financing and policies that would help get every girl into school. Or they could fall further behind by doing nothing. Poverty is sexist - it hits girls and women hardest. But educate a girl in one of the world’s poorest countries, and it can dramatically improve her health, wealth, and potential. She’s less likely to become a child bride, experience violence or contract HIV. And she could help lift her family — and her entire country — out of poverty. 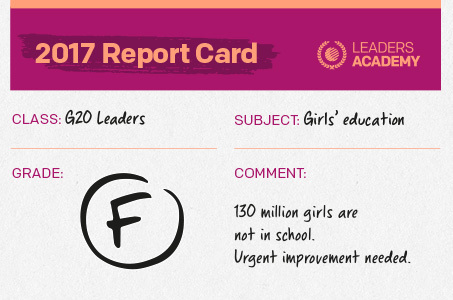 If you agree that all girls count, add your name to send G20 leaders their report card now. 130 million girls are not in school. That’s unacceptable. I’m counting on you to put in place adequate financing and policies to help ensure that every girl, in every country, gets the education she deserves. I believe girls count - I hope you do too.